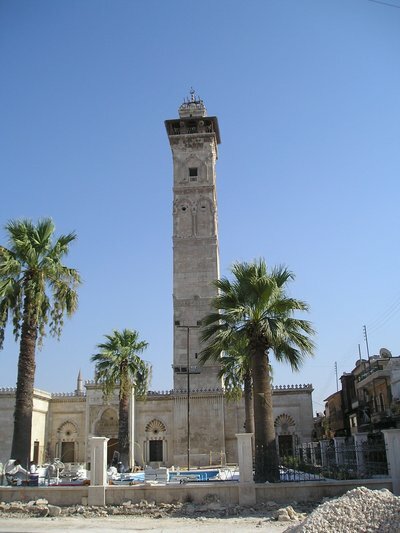 The Great Mosque, 13th c. CE, Aleppo, Syria -- Photograph 2005 Via Wikimedia Commons. The bloodletting in Syria should end any further romanticizing of the so-called "Arab Spring." There is more ugly reality yet to see as Egypt's experiment with the Islamist version of democracy unfolds. I do not speak lightly of the Arab-Muslim world's heart of darkness. I have seen it in the all-male crowded streets of Peshawar, in the bustling squares of the Shiite holy city of Qom in Iran, in Ramallah and other towns of the West Bank, in the squalor of overpopulated North African cities. There are the mosques and the calls to prayer. And as one steps inside them to join men at prayer, especially Friday's communal prayer, it is hard not to notice the combustible fusion of piety and anger taking hold of the young and old gathered together in solidarity against an unjust world outside. I have felt the blast of this anger poured forth from pulpits in Peshawar and in Algiers, as I have heard its echo right here in Canada. This is the Arab-Muslim heart of darkness — a repressed and roiling cauldron of anger seething to erupt at any moment with a mighty destructive force. The Syrian bloodletting is not only about a cruel despot and an oppressed people. It has all the elements of a replay of sectarian conflicts from the earliest decades of Arab-Muslim history. The rulers of Syria are Alawites, a minority within the minority Shiites surrounded by the majority Sunni Muslims. They see themselves as the historically wronged and persecuted minority among the heartless Sunni majority. They are supported by Iran, and Iraq ruled by a majority Shiite government in Baghdad. The lines have been drawn through Syria. Here the Sunni majority confronts the Shiite minority, and here the noise of the conflict reaches back to the bloodiest chapter in Islam's history in the seventh century. The same lines were drawn in the decade long war between Saddam Hussein's Iraq and Ayatollah Khomeini's Iran during the 1980s. And the same sectarian animus spilled over in post-Saddam Iraq during the terrible months of suicide-bombings and terror visited upon the country. In this unforgiving conflict, the West, Israel, Russia, China and India would be merely supporting cast if they wilfully got involved. The best the West can do is to be clear and certain about its absolute minimum non-negotiable interests in the region, and how these will be protected. But, most importantly, the West needs to maintain distance from the conflict it cannot resolve; since by stepping into it, and despite its goodwill, it will earn the enmity and ingratitude of the parties involved. In the year 680, the severed head of Husayn, grandson of the Prophet, fallen in battle was sent to the Sunni ruler in Damascus. The present Alawite ruler of Syria, Bashar al-Assad, finds himself cornered as were Husayn and his people in 680, and he knows what awaits him and his supporters if he were to lose. There is a long way to go before the Arab-Muslim world empties itself of its fury, of fighting its demons and blaming others for its self-inflicted misery. Here for now, however, politics is vengeful, history is clash of steel, and peace is desert mirage.